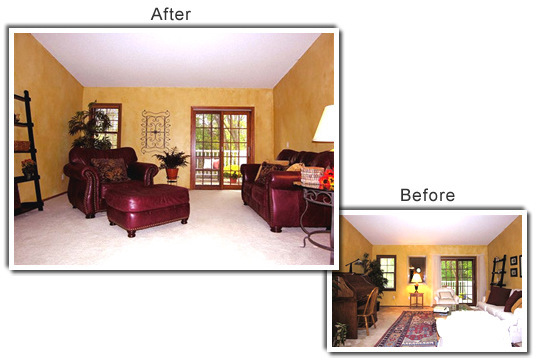 Project: a formal living room in Chanhassen. Positives: cathedral ceilings, new carpet and a walk-out deck. Negatives: gold, faux-painted walls, too much decor and clumsy furniture arrangement. When staging your home, you need to consider the overall presentation. In this case, the formal living room on the upper level had very bright walls with tall ceilings in contrast to the lower-level family room, which had very dark walls with low ceilings. "We needed to create balance and a spacious feeling on both levels, said Lori Matzke of Centerstagehome.com. "Swapping the furniture between the two rooms helped achieve that and allowed for a more open floor plan and consistent flow between spaces." Here's how Matzke put her plan into action. A clunky roll-top desk that the owner was planning to sell took up a lot of space, so rather than waiting for the house to sell, the transaction was completed early. The area rug went into storage. Rugs over carpet are distracting and tend to make rooms feel small and break up the floor plan. They also make a potential buyer wonder what you're hiding. In this case, storing the rug let buyers get a better look at the new carpet. Removing excess clutter, including a series of black-and-white photos, makes the room feel larger and more open. To open the view of the deck and back yard, the curtains were removed. Matzke swapped the white furniture for a larger set that was in the lower level. Bulkier pieces are appropriate for taller ceilings and dark upholstery looks better with the brighter upstairs walls than with the caramel walls downstairs. To give the leather a softer appeal, Matzke accessorized with large tapestry pillows in muted tones of brown and gold. Rearranging the furnishings to create a more open floor plan leads your eye directly to the sliding glass doors and deck, both positive selling features. Two matching bookcases (only one is shown) that had flanked the white sofa were teamed up on the opposite wall and accessorized sparingly to create the illusion of more ceiling height. In lieu of the large decorative mirror, which Matzke used to brighten a dark downstairs hallway, a decorative wrought-iron panel that was part of a coffee table was used to create more distinction between the window and door without adding more color to the already colorful walls. A small palm tree on a plant stand next to the sliding glass door draws your eye to the outside view. Colorful outdoor pillows on a bench on the deck and a yellow mum add attention-grabbing color.